NASA's Mars InSight lander has nearly completed its nearly 300 million mile journey and is preparing for a landing on Mars on Monday afternoon, at about 3 pm Eastern time. 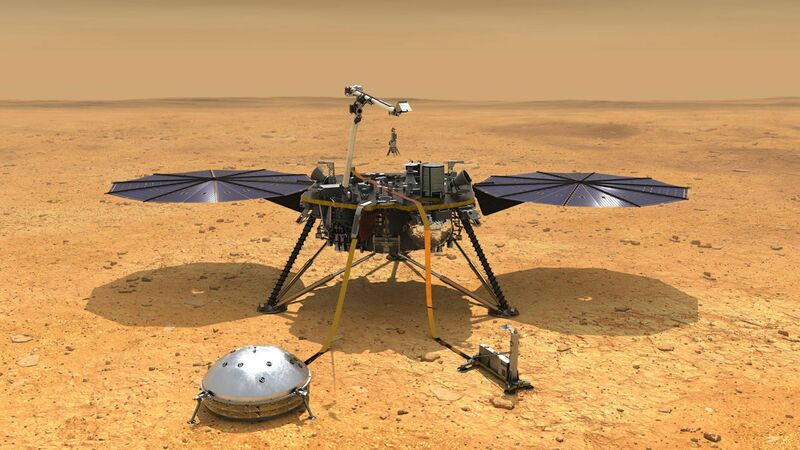 Why it matters: If successful, the InSight lander would become the first U.S. robot to land on Mars since the Curiosity rover arrived there in 2012. Unlike other spacecraft sent to Mars, this one is not designed to seek signs of life, but rather to investigate the planet's interior for clues into how certain planets, including Earth, formed about 4 billion years ago. What to watch: The U.S. is the only country to have successfully landed spacecraft on Mars, but a glitch-free landing is by no means guaranteed. Mars InSight will enter the planet's atmosphere at a dizzying speed of about 12,300 miles per hour, and friction will heat the spacecraft up to 2,700 degrees Fahrenheit. A parachute and retro-rocket thrusters will work to slow it down sufficiently for a three-legged, soft landing on the Elysium Planitia — a flat region near the planet's equator. This landing will differ from some of the previous rover landings, which involved a bouncing ball-like structure with the rovers sheltered inside. The Curiosity rover landed with the assistance of a skycrane, in which a descent stage slowed to a hover and lowered the rover to the ground — the culmination of a descent dubbed the "seven minutes of terror." Launched on May 5, InSight will be the first spacecraft to drill down into the deep interior of the Red Planet, and scientists hope the data it gathers will give them clues into how the rocky planet formed. "InSight will address a fundamental issue of solar system science, not just specific questions about a single planet. By studying Mars, InSight would illuminate the earliest evolution of rocky planets, including Earth," NASA said in a mission fact sheet. Two miniature spacecraft, known as Mars Cube One, are following InSight, but they won't land on Mars. Instead, they'll serve as data relay stations to send information gathered by InSight to scientists on Earth. These two spacecraft are the first-ever CubeSats, which are a category of ultra-small satellites, to go into deep space. The mission isn't entirely a NASA operation. Several European institutions have contributed to its payload, including France's Centre National d'Études Spatiales (CNES) and the German Aerospace Center (DLR). How to watch: NASA will air live coverage of the InSight landing online starting at 2 pm Eastern on Monday. In addition, the agency is hosting watch parties at more than a dozen locations in the U.S. and other nations.